When you’re away from home it’s often the little things you miss, and nothing brought that home to me more this week than watching the story of Mei Barry unfold. For those who don’t know, Mei Barry is the 17 year old New Zealander who was one of 64 people rescued from a Canadian ship full of high school and university students on an educational trip. The ship sank and the students spent nearly 40 hours in the life rafts waiting to be rescued. Apparently Mei had never sailed before and was scared prior to going on the ship. Her father, Desmond, told 3News one of the hardest moments was to let her go on the boat knowing how afraid she was. And what did she ask for when they finally managed to speak to her? Milk Bottle lollies! I would say she deserves a lifetime supply. I guess that’s where mail can’t be beaten – when you need to send something physical – large or small - mail’s the only thing that can do the job. Fortunately it’s easy to pop a packet of lollies in a bag and post them off anywhere in the world. 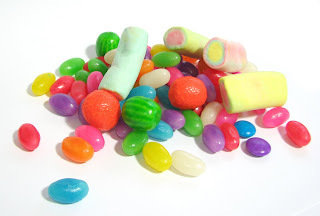 I hope that Mei’s Milk Bottles are well on their way by now – and if you’d like to receive some lollies, leave a comment about the best thing you've received in the mail, and I will send a packet out for the best anecdote. Now that I’m writing a blog I’m starting to notice how many there are out there, and even checking out one or two. Sometimes they pop up when I’m least expecting them, like Sarah Kate Lynch’s on the ASB banking site - it was very entertaining and I’ll check it out again, but I’m not sure what it had to do with banking. So then I got to thinking, does that matter? And I guess that’s the thing with social media – everything I read says it’s about creating valuable two way communication, and to do that you need to know what presses your customers’ buttons. Looking back I see plenty of evidence of you interacting with redline - in December we asked how you would feel about some proposed changes to the ParcelPost range of products, a nd that certainly generated some comment! It was great to get all your feedback and we’ll be using it to help us in our planning for the development of this range of products going forward. The number of comments received suggests there are quite a few of you out there using ParcelPost on a regular basis – so make sure you check out our current 15% off sale on ParcelPost postage included bags and pre-paid tickets, available exclusively online. We’ve also had a couple of comments asking us to look in more detail at the Business Services industry in a future edition of redline. So, we’re planning this will be a key feature in Issue 9, due out in July. I’d love to hear more about what you’d like to see us include – we want to make sure redline is an engaging and relevant read, so let me know what you’d like covered. Maybe you have ideas on specific products we should be developing, or improving existing ones, or perhaps you’d like us to look at general trends in this area and how they are affecting businesses like yours. Whatever your thoughts, we’d love to hear them – the good, the bad and the ugly! With most of us back at work, the kids back at school, and the sun finally now deciding to shine, our thoughts here at redline are focused once again on our next edition of our magazine. Not only is it a New Year, it’s also a new decade and so what better time to take a fresh look at what you do and how you do it? That’s certainly what we’ll be doing here at redline - with the explosion of the internet and social media it sometimes feels it’s hard to keep up, or even work out, how and what we should be keeping up with and this is something we’re planning to look at in our next issue. Personally I hardly ever look at my Facebook page, and I’ve never even tried Twitter, but increasingly it seems I’m in the minority - even my local cafe offered to ‘tweet’ me their latest news when I went in for my usual morning latte! And so, as I tentatively venture into the world of blogging, the time has come when I can no longer ignore what is increasingly becoming the norm. Having just read that there are now over a hundred million bloggers worldwide it’s clearly not something limited to the early adopters! What I am really looking forward to is the opportunity blogging affords to communicate directly with our customers, so please continue to send us your thoughts on our magazine and blog so that we can continue to ensure it’s relevant and helpful to you. I’d love to hear any stories you have of how your business is embracing these new media choices, so post your comments and share your experiences with others in the redline community. I shall be babysitting redline whilst your usual editor, Louisa, settles into life with her beautiful new baby son, and we wish her and her family all the best as they move into this new phase of their lives.